Scans of some beautiful European car brochures from the 1940s, 50s and 60s, courtesy of André Le Roux in France. Bonne Année, everyone. For a couple of years now we’ve had the domain TurnpikeCruiser.com stashed at the back of a sock drawer, collecting lint. Our business manager, who’s always full of good ideas, suggested dusting it off to try out some new gallery software and test our relational database skills. So, armed with the latest edition of “PHP and MySQL for Dummies,” we present these rusty old trucks at the Gold King Mine in sunny Arizona. 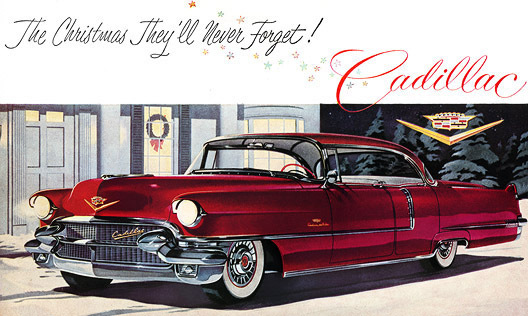 December 1955: Merry Christmas from Cadillac, and Plan59. Here’s all the warmth and charm of an Early American kitchen combined with the down-to-earth modern utility of colorful Formica sink and cabinet tops. If your dreams fun to the “frilly” or if they shape up as strictly functional, they are best realized by insisting on Beauty Bonded Formica. Never worry about rotting . . .
presenting . . . the childhood home of Mr. David Lynch. They don’t make cities of the future like they used to, as shown by this 1959 illustration for Carrier’s Landmark line of air conditioners. Absent in the City of 2006: Bubble-buildings, swooping monorails, twirly expressways, levitating Christmas ornaments, receding lines of perspective, purple pavement, Giant Scary Hand. Exciting in its mood . . . brilliant in its styling . . . dazzling in its beauty — the dramatic Eldorado introduces an entirely new concept of motor car design. From its low, graceful silhouette . . . from its bold, massive grille . . . from its long, sloping rear deck — it is inspiring as no other automobile ever built. The unusual lowness of the Eldorado is accentuated by a unique and distinctive dropped-door design. At the rear of the door, the Eldorado is only 37 inches in height — from 3 to 4 inches lower than the standard Cadillac convertible in its over-all silhouette. Bringing this magnificent styling to even fuller life are four special body colors — Aztec Red, Azure Blue, Alpine White and Artisan Ochre. If ever a motoring creation exceeded the fondest visions of America’s automotive enthusiasts — that car is the Eldorado! For the 1953 model year, General Motors offered three custom convertibles based on themes first glimpsed in its “dream cars” — concept cars that toured the country in the Detroit traveling circus known as the Motorama. 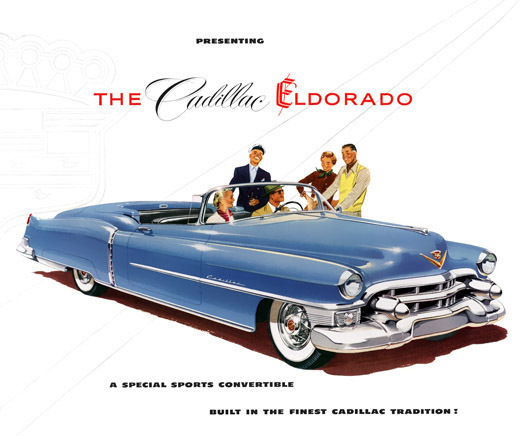 Top of the line, above the Oldsmobile Fiesta and Buick Skylark, was Cadillac’s Eldorado, a relatively restrained Harley Earl dreamboat that impressed more with form than with chrome and whose rocket-ship styling touches hinted at the car’s astronomical price tag. Examples in good condition today command well into the six figures. You’ll be the envy of the neighborhood when you drive the Porter-Cable Yard Master across your land. With its sleek automotive styling, it’s the world’s most beautiful, and practical, lawn rider. You’ll instantly recognize how different and superior it is. Yes, the nabes will all be out on their lawns pointing, not to mention snickering, should you choose to pilot your mower in Bermuda shorts and driving cap. This priceless illustration, of the Yard Master Mark 26, is from 1959. The steering mechanism looks a little iffy to us. We’ve started a BlogSpot blog, with images from a Flickr photoset, for anyone wanting to leave comments. These are linked from P1X1.com (“Pixi”), a kind of Plan59 lite that we set up to give you a sneak peek at upcoming posts. Our inspiration here (i.e. we stole the idea from him) is the uber-talented Dan Goodsell, of Mister Toast fame. Mercury spans the element of time by offering you the very first DREAM-CAR you can drive today. From the triumphant Turnpike Cruiser through the bold beauty of the Montclairs and Montereys, to the dramatic hardtop-styled Station Wagons, Mercury’s Dream-Car fleet proclaims a new era in motoring history. Up until now, so- called “cars of tomorrow” have been strictly experimental models that teased your motoring appetite with features that “some day” might be yours. Now the magnificent 1957 Mercury leaps ’way ahead to bring you the shape of things to come — TODAY! The Turnpike Cruiser, with its windshield air intakes (decorated with faux antennae), retractable backlight, memory power seat, trip computer and other gewgaws, was part Buck Rogers and part Detroit jukebox. After the 1957 and 1958 model years, it was history. Put yourself in this picture of stirring Big M action. See its new advanced shape — the shape of things to come — huge new windshield . . . rakish projectile side channels. Experience the thrill of this beauty under way — there’s absolutely nothing like it on the road for minding its manners and instant obedience . . . The 1957 Mercury Montclair four-door sedan, in our very favorite color scheme: Flo-Toned Moonmist Yellow and Regency Gray. This Sunday-supplement cover by Pete Hawley from 1959 shows him between the va-va-voom Jantzen bathing-suit girls that defined his career and the kitschy kids that capped it. We used to have PJs just like this, only in blue. Fifteen more of them, indexed here. The “new” ones are here and from here to the end. After this there are about three dozen more. A thumbnail guide to some of our collections that you may have lost track of.